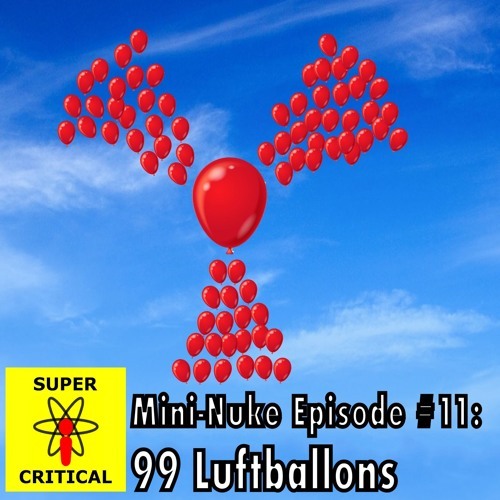 In this episode, we tuned the radio to the song 99 Luftballons (or 99 Red Balloons) by the band Nena and talked about its connections to nuclear weapons, the Cold War arms race, and anti-nuclear protests. How did the threat of intermediate range nuclear missiles in Europe inspire Nena to write this catchy dirge? What happens when early warning systems confuse 99 balloons for UFOs and nukes? What artist will win their Grammy with a song about the dangers of Gamma Rays? Tim Westmyer and returning special guest Will Saetren (@WillSaetren) answer these questions and more. This is the 11th in our Mini-Nuke episode series, where we overthink pop culture with a smaller slice of nukes than our usual full-sized episodes. Playlist of nuke songs: https://www.youtube.com/watch?v=frAEmhqdLFs&list=PLXh-L52NGj3wWH92cBVAjeW-7giQ2B4vW Before we hit shuffle on our nuke war mix to lament the death of the INF Treaty, we recommend checking out: -The Man Who Saved the World (2014 documentary) -Rush, “Distant Early Warning,” Grace Under Pressure, 1984 -No Nukes: The Muse Concerts for a Non-Nuclear Future (1979) -Jeffrey Lewis, The 2020 Commission Report on the North Korean Nuclear Attacks Against the United States, 2018 -Eric Schlosser, Command and Control: Nuclear Weapons, the Damascus Accident, and the Illusion of Safety, 2014 Check out our website, SuperCriticalPodcast.com, for more resources and related items. We aim to have at least one new episode every month. Let us know what you think about the podcast and any ideas you may have about future episodes and guests by reaching out at on Twitter @NuclearPodcast, Spotify, GooglePlay, SoundCloud, TuneIn, Stitcher Radio, Facebook, SuperCriticalPodcast@gmail.com, and YouTube. Enjoy!